Negative ions and plasma are natural air purifiers that have a number of useful health benefits, including the ability to eliminate odors and reduce harmful substances that frequently occupy indoor air. For optimal human health, it is important to remove bacteria, toxins and contaminants from home and indoor areas. Doing so greatly reduces the risk of contracting serious and life-threatening illnesses. 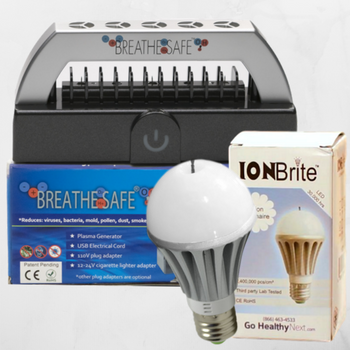 The Breathe Safe portable plasma generator and ION Brite anion LED negative ion generating light bulbs from Creatrix Solutions seize the power of plasma, nature's "vitamin of the air", and healthy amounts of negative ions. Plasma and negative ions are two alternative air purification solutions that work to efficiently, quietly and safely clean and purify indoor air without expensive air filters. The Breathe Safe is a portable plasma generator and oxygen booster that generates millions of air cleaning negative ions while increasing oxygen in small areas by 70-118% in as little as five minutes. It can be used at home, in the car, and is great for generating ions inside a sauna. The ION Brite Anion LED doubles as both a mercury-free, energy-saving LED light bulb and a tiny, filter-free air purifier that works quietly with the simple flip of a light switch. The Tri-Oxy RE-ION (discontinued and replaced with Breathe Safe + Tri-Oxy Fresh) brings the power of ozone and plasma into your home and functions as both an air cleaner and an oxygen-boosting water ozonator.